Our dynamic team is based in the Clinical Research Centre at the University of Cape Town. We are running a large, randomized controlled trial investigating lithium as an augmentation strategy in the management of HIV-associated neurocognitive disorders. 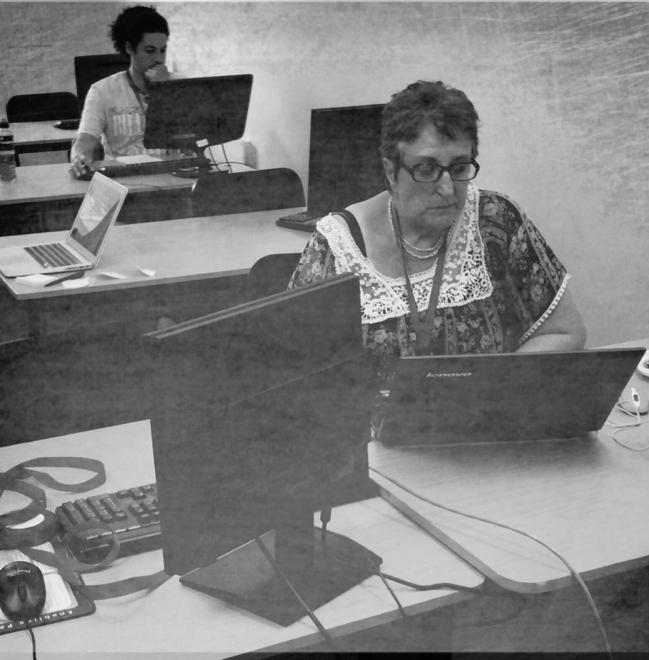 From April 2014 - April 2015, the South African regional Global Health Trials faculty conducted a pilot study whereby a group of clinical trial support staff within Cape Town worked with the pilot study research team to develop a blended-learning intervention based on and around the Global Health Trials online resources. Commentary was made on current career development challenges, existing career pathways, and ideas for a blended learning program that could be individualised and flexible according to time availability. The latter included the Global Health Trials online resources enhanced with face-to-face interactions (various combinations of: facilitated group eLearning sessions including an opportunity to discuss issues with an expert, one-on-one eLearning sessions with/advice from a pilot study team member, job shadows, twinning with a London clinical trial site, and ideas for accessing other cost-effective training opportunities). A calendar was developed which ran over a 6 month period. Semi-structured interviews with line managers and focus group discussions with study staff were conducted over a five month period. These initial discussions created a confidential inclusive platform where line managers and their staff were able to share thoughts and ideas. The intervention proposed, included various combinations of: facilitated group eLearning sessions including an opportunity to discuss issues with an expert, one-on-one eLearning sessions with/advice from a pilot study team member, job shadows, twinning with a London clinical trial site - https://globalresearchnurses.tghn.org/community/groups/group/twinning/ and ideas for accessing other cost-effective training opportunities. The Global Health Trials website was also an ideal platform for discussions with the pilot study group and others within the network, and this page was made available to document our experiences during the study. It currently serves as an online example of how a blended learning disccussion forum and page could be setup and as a chronicle of our chapters activities for 2014-2015. See preliminary results from the pilot study here. This is an introductory course aimed at introducing the learner to the basic concepts involved in clinical research for our pilot study, participants were advised to complete this course in the week of the 10th - 14th November 2014 and share any challenges experienced whilst completing the course at the expert discussion on the 14th November 2014. Please feel free to share any experiences whilst completing the course at the link to the discussion below. This is an introductory course aimed at introducing the learner to the basic concepts involved in informed consent, for our pilot study, participants are advised to complete this course in the week of the 24th - 28th November 2014. On Monday the 24th November from 12:00-17:00, the computer lab on the L-Floor in the Clinical Research Center (UCT), Groote Schuur Hospital (Old Main Building) is available for use. These questions will then be discussed on the 28th November 2014 between 13:00 -14:00. Please contact the project coordinator at cordelia@globalhealthtrials.org for more information about the discussion session. This is an introductory course aimed at introducing the learner to the basic concepts involved when formulating the research question, for our pilot study, participants are advised to complete this course in the week of the 8th -12th December 2014. On Monday the 08th December 2014 from 12:00-17:00, the computer lab on the L-Floor in the Clinical Research Center (UCT), Groote Schuur Hospital (Old Main Building) is available for use. These questions will be discussed on the 12th December 2014. Please contact the project coordinator at cordelia@globalhealthtrials.org for more information about the discussion session. This is an introductory course aimed at introducing the learner to the basic concepts involved when designing a study protocol, for our pilot study, participants are advised to complete this course in the week of the 05th - 09th January 2015. On Monday the 05th January 2015 from 12:00-17:00, the computer lab on the L-Floor in the Clinical Research Center (UCT), Groote Schuur Hospital (Old Main Building) is available for use. These questions will then be discussed on the 09th January 2015. Please contact the project coordinator at cordelia@globalhealthtrials.org for more information about the discussion session. This is a follow up to the introductory course aimed at building on the basic concepts involved when designing a study protocol, for our pilot study, participants are advised to complete this course in the week of the 19th - 23rd January 2015. On Monday 19th January 2015 from 12:00-17:00, the computer lab on the L-Floor in the Clinical Research Center (UCT), Groote Schuur Hospital (Old Main Building) is available for use. These questions will then be discussed on the 23rd January 2015. Please contact the project coordinator at cordelia@globalhealthtrials.org for more information about the discussion session. This is an introductory course aimed at introducing the learner to the basic concepts involved when setting up a Data Safety Monitoring Board for Clinical Trials, for our pilot study, participants are advised to complete this course in the week of the 02nd - 06th February 2015. On Monday the 02nd February 2014 from 12:00-17:00, the computer lab on the L-Floor in the Clinical Research Center (UCT), Groote Schuur Hospital (Old Main Building) is available for use. these questions will then be discussed on the 06th February 2015. Please contact the project coordinator at cordelia@globalhealthtrials.org for more information about the discussion session. This is an introductory course aimed at introducing the learner to the basic concepts involved in data management, for our pilot study, participants are advised to complete this course in the week of the 16th - 20th February 2015. On Monday the 16th February 2015 from 12:00-17:00, the computer lab on the L-Floor in the Clinical Research Center (UCT), Groote Schuur Hospital (Old Main Building) is available for use. these questions will then be discussed on the 20th February 2015. Please contact the project coordinator at cordelia@globalhealthtrials.org for more information about the discussion session. This is an introductory course aimed at introducing the learner to the basic concepts involved in collecting and reporting adverse events, for our pilot study, participants are advised to complete this course in the week of the 02nd - 06th March 2015. On Monday the 02nd March 2015 from 12:00-17:00, the computer lab on the L-Floor in the Clinical Research Center (UCT), Groote Schuur Hospital (Old Main Building) is available for use. Please feel free to share any experiences whilst completing the course on the relevant discussion page of this website, these questions will then be discussed on the 06th March 2014. Please contact the project coordinator at cordelia@globalhealthtrials.org for more information about the discussion session. This is an introductory course aimed at introducing the learner to the basic concepts involved when conducting a GCP audit, for our pilot study, participants are advised to complete this course in the week of the 16th -20th March 2015. On Monday the 16th March 2015 from 12:00-17:00, the computer lab on the L-Floor in the Clinical Research Center (UCT), Groote Schuur Hospital (Old Main Building) is available for use. PLEASE BEAR IN MIND THAT OUR PILOT STUDY PROJECT WILL USING THIS COURSE, AS A TOOL ON HOW TO PREPARE FOR A GCP INSPECTION AND THE DISCUSSION WILL BE AROUND SURVIVING A GCP AUDIT. Please feel free to share any experiences whilst completing the course on the relevant discussion page of this website, these questions will then be discussed on the 20th March 2015. Please contact the project coordinator at cordelia@globalhealthtrials.org for more information about the discussion session. This is modular course aimed at building the learners understanding of research ethics, for our pilot study, participants are advised to complete this course in the week of the 13th - 17th April 2015. On Monday the 13th April 2015 from 12:00-17:00, the computer lab on the L-Floor in the Clinical Research Center (UCT), Groote Schuur Hospital (Old Main Building) is available for use. Please feel free to share any experiences whilst completing the course on the relevant discussion page of this website, these questions will then be discussed on the 17th April 2015. Please contact the project coordinator at cordelia@globalhealthtrials.org for more information about the discussion session. Estimated enrollment: 50, Enrolled: 44, an additional 2 participants to join from Stellenbosch shortly. The challenges have been finding time to meet with individuals due to time constraints of study staff, as well as managing the need to be flexible as not "one size fits all"
On the 19 September2014 our local South African Faculty supported by Global Health Trials, hosted our National Skills Sharing workshop for detailed information about the workshop and to access the presentations, please follow the link supplied below. There sometimes is a lack of understanding by participants about care versus research. Potential participants must be given time to take in the study information; those who invest time and return generally understand more and can be more adherent. The version of the signed consent may not necessarily be the home language of a participant but nevertheless is his/her choice. This may be challenged by foreign research groups who do not understand the situation. The group was highly critical of certified translations that do not reflect the local dialect (despite the nice certificate which ticks the GCP box!). Staff should not be afraid to raise issues if the translated version is not 'working'. An interesting recent situation was that potential participants in a certain community refused to sign their name. There was no consensus about whether to exclude them, use a pseudonym or otherwise. Please feel free to add your thoughts about the matter and share articles of interest at https://globalhealthtrials.tghn.org/articles/south-african-faculty-discussion-informed-consent/ . 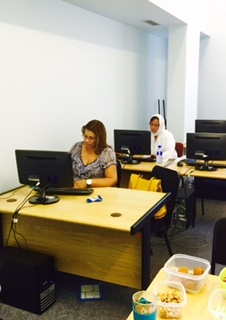 GHTSA managed to sneak in a photograph or two whilst our participants were busy completing their online courses! We had 5 people attend the discussion session on Friday 09th January 2015. Please follow the link for our commentary. The members of the PreART team took an hour out of their day on Tuesday, 13th January 2015 to complete the "Introduction to Informed Consent" eLearning course. 4 people attended a F2F session, one of them took a couple of minutes to update himself on the latest GHTSA News. We had 6 people attend the discussion session on Friday 23rd January 2015. Please follow the link for our commentary. The discussion was moved to Friday, 27th February - as one of our experts was not available on the 20th. 9 people attended the dicussion session on the 27th February 2015. 0 at the BIRTH lab Moday session, 1 face2face. 7 people attended the discussion session on adverse events. On the 3rd of March 2015 as a part of our blended learning program - Miss Lavinia Petersen and Sr Daphne van Ster visited the South African TB Vaccine Initiative site in Worcester. Please follow the link below for an detailed report on the job shadow experience. 0 at the BIRTH lab Moday session, 1 independantly. 5 people attended the discussion session on "How to Conduct a GCP Inspection". Please feel free to follow the link below for our commentary. This is a tool that has been created to enable equity in access to research opportunities. Through this facility research sites (and potential research sites!) can register and let would-be collaborators and sponsors know about them, their previous experience and what type of research they would like to take part in.